continuously for a long time. "LI" make The instrument is designed for accurate estimation of moisture in various Solid, Liquids or Gas samples. It works on Volumetric Principle. - Memory Storage: 100 Test Methods (User Programmable). 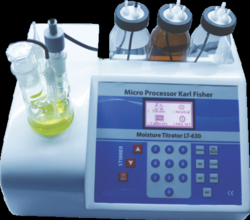 Auto Karl Fischer Titrimeter with array of 10 LED’s, buzzer, auto zero burette, adjustable timer, dusl platinum electrode and other accessories. Spectralab Model CM - 08 is based on the principle of Coulometry. It detects the moisture content from 1ppm to 5%. In this method the reagent is generated electrolytically in the titration vessel. the moisture is calculated by using the titration time and the constant current passed. It is micro controller based, reliable & easy to use. 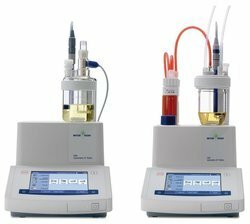 Clients can avail from us Spectralab’s range of Karl Fischer Titrator (for water determination) includes Coulometric KF Titrator CM-08 for trace moisture determination ie from ppm to % level and Karl Fischer Volumetric Titrator for moisture detection in the range 10ppm to 100%. From our extensive compilation of range, we provide Digital and Microprocessor Karl Fischer to our patrons. Made up at par with the guidelines laid down by the industry, these are highly required. In addition to this, these are examined sternly before finally dispatching at the end of our patrons on time.